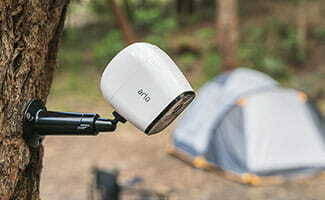 The Arlo Go is an innovative and unique cellular-monitored security camera that works in areas without Wi-Fi. Its performance, app, and features are top of the line, but it loses some points for its high price and patchy customer support. The Arlo Go security camera is equipped with an LTE SIM card, much like the one your cellphone uses. It sends alerts and video clips to an app on your mobile device. (It also works on your desktop computer and Amazon Fire TV.) Like other Arlo cameras, the Arlo Go is a beautifully designed, high-performance camera that’s supported by one of the best home security apps out there. This all comes at a price, but to protect your home and valuables, it’s well worth it. Wi-Fi based, app-monitored IP cameras are great for checking in when you’re away from home, but what do you do when your vacation home (or RV, or boat, or worksite) doesn’t have Wi-Fi? This is where NETGEAR’s Arlo Go comes into play: it’s a camera that operates over a cellular LTE network instead of through a Wi-Fi router. The original Arlo camera is in our top picks for the best security cameras, but the Arlo Go is next-level. The Arlo Go is one of the few consumer-friendly cellular security cameras in the US. Cellular security cameras have been around for a number of years, but until now, these systems have cost thousands of dollars and have been designed for business and government purposes, not for the average person’s home security. While the Arlo Go is still on the expensive side (our biggest complaint), it’s within reach for someone who really needs internet-free security in a remote place. Arlo also has an app robust enough to support all the powerful features of its cameras, a surprising rarity for app-monitored cameras. The intuitive, feature-rich Arlo app is consistently well-reviewed in the iTunes, Google Play, and Fire OS stores, and this high performance extends to the Arlo Go as well. 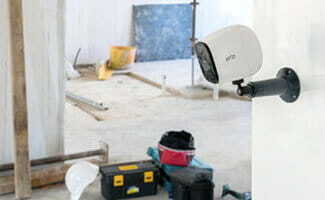 In the past, a five-second delay between motion detection and recording was a common complaint with the Arlo IP cameras, but many customers report that this delay has been fixed with the Arlo Go. Since the Go runs on LTE, you’ll need to sign up for a cellular service to use it. You’ll get a different model of the Go depending on which service provider you get. The cameras themselves are exactly the same, but they’re sold under different model numbers for each different network SIM card. This can get confusing, so we’ve compiled the various model numbers below. If you already have an Arlo Go, you can find the model number inside the battery compartment. We’ve seen a lot of complaints about AT&T’s compatibility and support of Arlo Go. There’s a video advertisement for it on the AT&T website, but it’s not available in its web store. Many folks who contacted AT&T for support said that its customer service representatives had never even heard of Arlo Go and couldn’t provide the support they needed. We recommend going with Arlo Mobile or Verizon for your cellular service providers because they are the best equipped to offer support for the product. Of all available service providers, Arlo Mobile has the most transparent pricing. If you already use Verizon or AT&T as your cell service provider, your Arlo Go monitoring can be added on to your cellphone bill. Rates will depend on your current service contract. Depending on your settings, a motion or sound event will trigger the camera to begin recording a 30-second video clip. These clips are sent to the Arlo app for you to review. If you use up all your clips before the month is over, you can always upgrade to a higher plan. You can also tune in and livestream without cutting into your valuable clip count. There’s about a three-second delay in the livestream because the transmission has to go through the cellular network, but it shouldn’t be a big deal for most users. There’s a 20% discount when you pay for a year’s worth of monitoring up front, but paying month by month gives you the flexibility to pause your monitoring at any time. For example, if you use the Arlo Go to monitor a vacation property, you could pause your monitoring subscription for the months you’re there and only pay for the months you’re away. While the Basic storage plan is enough for most people, if you’re using an Arlo Go or two to monitor a vacation property and a handful of other Arlo IP cameras to monitor your everyday home, you may need to upgrade to a higher plan to support all your devices. The price of Arlo cameras, service, and storage can add up, but there aren’t many other companies that offer the same level of versatility and flexibility as Arlo. Too often an innovative idea is paired with subpar hardware. Not so with the Arlo Go. It features a high-performance 720p HD camera with a wide field of view (130°) and 8x digital zoom. Its infrared night vision is adjustable up to 23 feet, so you’ll get a clear picture even in the dark. Some customers have commented that, like most cameras, the Arlo Go struggles in high-contrast situations, so you’ll want to make sure to position it accordingly to avoid deep shadow and intense sunlight. Audio and motion detection activate recording and mobile notifications. From the app, you can adjust the sensitivity of these sensors and decide what you want to trigger the camera. For example, if you’re monitoring the inside of a barn that shouldn’t get a lot of activity, you’ll probably want to use both motion and sound detection at their maximum sensitivity. If you’re recording in an area where wind in the trees or passing cars could trigger the motion detection (and unnecessarily use up all your 30-second clips for the month), you may want to turn down the motion detection sensitivity. The Arlo Go can be used for both indoor and outdoor surveillance. It operates between -4°F and 113°F and is rated IP65, which means it’ll hold up against even fairly heavy rainfall. If you use it outside, it’s still a good idea to protect it from direct sunlight and precipitation by placing it under the eaves of a roof or someplace similarly protected. Even if the temperature of the air falls within the operating limits, accumulation of snow on the camera could lower the temperature below -4°F, or prolonged direct sunlight could raise the temperature above 113°F. To better protect against the elements, Arlo offers a variety of skins for the Go. 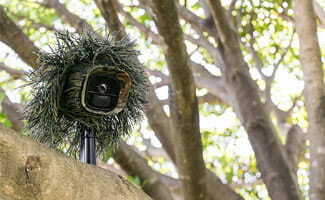 These make the cameras more waterproof, provide some insulation, and allow for a bit of camouflage, making your camera less conspicuous. Other accessories include a solar panel (a solution for those monitoring a remote property they visit only a couple of times per year) and additional rechargeable batteries. Arlo has support articles for nearly every question we could think of. Plus, it hosts searchable user forums where customers help each other troubleshoot and find solutions. If you can’t find the answer you’re looking for between those two, Arlo has a live chat feature. While we always like seeing chat support, Arlo asks for a contact phone number, which may deter some people. We’ve always received decent customer service from Arlo, but the Arlo forums and Amazon reviews reveal quite a few complaints about the company’s after-purchase support. In particular, those who bought an AT&T Arlo Go were frustrated with the lack of knowledge about the product from both Arlo and AT&T support. What do customers think of the Arlo Go? Most critical reviews revolve around poor customer service and a lack of clarity about which model they were buying. Except for with the Arlo Mobile and Verizon versions, Arlo isn’t very upfront about which model is which, so a lot of people found that they’d purchased a different version than they wanted. Other than these issues, customers are generally very happy with the hardware and app interface and found that the Arlo Go is a perfect solution for their remote monitoring needs. “1. The Arlo Go battery drains faster than you are led to believe even under their recommended ideal conditions. 2. The data plans are a complete scam. I purchased the 2hr a month plan and it ran out of data after recording only 15 ten second videos. Not only that even if you disable the camera it still consumes data. Do we recommend the Arlo Go? We absolutely recommend the Arlo Go, but we recognize there is room for improvement. The Arlo Go is a truly one-of-a-kind product that doesn’t sacrifice quality hardware or software for novelty. The HD camera is full of features, and a high-quality app makes it easy to customize those features for your needs. Arlo makes great products, but we wish it offered equally great support for when these products run into problems. We’d love to see more up-front clarity about which specific model customers are buying and better knowledge training for its customer service team. At around $400, the Arlo Go is fairly expensive for a single device, and that’s before the additional cost of monitoring and storage plans. However, if you have a remote property without Wi-Fi to monitor, you will likely find that the Arlo Go is well worth the price and a valuable addition to your overall home security. Do you have an Arlo Go? How’s it working for you? Tell us about your experience in the comments.